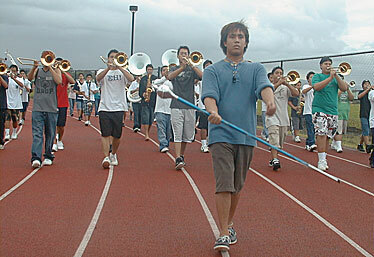 Jace Saplan, drum major of the 70-member Kamehameha High School marching band on the Big Island, led the musicians around the school's playing field during practice on Wednesday in Keaau. KEAAU, Hawaii » Kamehameha Schools band director John Riggle wasn't about to let 70 Big Island kids from the Keaau campus of Kamehameha High School get complacent about marching in the Rose Bowl parade in Pasadena, Calif. When he noticed a couple of kids whispering while he was talking to the group Wednesday, he knew they were nervous about the parade on Jan. 1. "You know it in your sleep," he assured them. "Every one of you knows this back and forth. Focus, focus, focus. Do not cave." Riggle is taking to Pasadena 150 kids from the Kapalama campus on Oahu, 70 from the Keaau campus on the Big Island and 20 from the Maui campus. He has taken Kapalama to the Rose Bowl four times, but he has never taken three groups of marching musicians who have never worked with their counterparts from other islands before. Today, from 1 to 4 p.m. in the parking lot of Aloha Stadium, all three groups will meet and march with each other for the first time. Mayor Mufi Hannemann will be at the practice at 2 p.m. to honor the "All Warrior Band" with a proclamation. They fly to the Los Angeles area on Christmas Day. On Rose Bowl day, the bands march six miles, then perform in the "Passport to the World's Celebrations" halftime show. With youthful musicians who already know how to play and march, Riggle had one big lesson for them Wednesday: how to get onto the playing field in an orderly way. "We've never done that before," he said. "They got it today. They know what it is." He also has to get them ready to make a smooth 109-degree turn from Orange Grove Boulevard onto Colorado Boulevard, the main parade route, while 1.5 million people watch along the route and 60 million watch on worldwide television. Jace Saplan, a senior at the Keaau campus and that group's drum major, said he knows Riggle is getting the group toughened up, and they're ready for it. "It just snaps into focus. What it comes down to is heart, to have the spirit," Jace said. The attitude will be, "I'm here to represent my culture and my state well." Discipline is not just for the parade and the playing field, Riggle warned. Participants have a buddy system, but on one trip, two buddies got separated. One was left behind sleeping at the back of a bus. He woke up at 1 a.m., locked in a bus garage, Riggle tells students and parents. "Travel is work," he tells them. Jace's father, John Saplan, knows that. He is head of the Kamehameha Hawaiian Band Ohana, the organization that earned $2,100 per person to take the group to Pasadena. That's $6,300 for Jace and his mother and father. The number of parents on the trip will be about equal to the number of marching musicians. They are going to end up being proud of sharing the name Kamehameha, Riggle predicted. "You're a hero," he said. "Enjoy it."